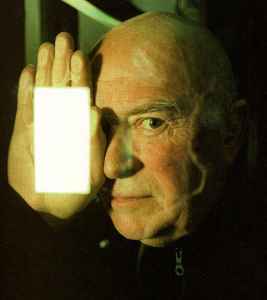 Conrad Schnitzler (17 March 1937 - 4 August 2011) was an institution in the German electronic music scene for thirty years. He studied with Joseph Beuys in the mid 1960’s, and in the late sixties joined the then fledgling German rock band Tangerine Dream. He added a bizarre, conceptual approach to Tangerine Dream that catapulted the band to legendary status, documented on the bands first album “Electronic Meditation”. Schnitzler left after that first album, forming with his friends Moebius and Roedelius the band Kluster. Kluster recorded and released three albums before Schnitzler again left, this time to pursue his own work under his own name. Kluster continued with just Roedelius and Moebius under the name Cluster. Since the demise of Kluster, Schnitzler released hundreds of albums, cassettes, and CDs, both on his own, and on various labels around the world. Schnitzler passed away in 2011, victim of stomach cancer. His last work was made just 4 days before his passing. Still miss Con. I agree with the post below, many would love to see some of those private releases given a proper release by someone very close. I think that would great to see. From 00/014 onward...it's only like 800 releases, right? hahaha...seriously, would love to see someone release a few of them at least. First of all, its nearly 7 - seven years since CON`s Death, but his Music keep living. BUT!!!! There is a but from me, can someone who are deeply into CON`s huge amount of releaes help me and othe CON-fans With a updated list? Know there eill be a huge Project.. Here on discogs there are mentioned 184 releases. Only the CONTEMPORA series Counts 830 single releases, someone are mentioned here, but the list are such a mess. Many are listed withouth date of release, so it goes for <unknown>. Hope someone whoe reads this are able to help, I will surtenly try to help as well if I can. RIP CON. Listen and buy if you like them! Whatever he did - I always enjoy it. Scene-setter and visionary. Unstoppable musical force. Yesterday in a cd sale in town I picked up 4 promo albums on cd for less than £3. Bargain of the year so far easily. Gelb, Grun, Congratulacion and Con-Struct. Listening now. rip Conrad. THE KING OF THE ELECTRONIC SOUND! YOU WILL BE THE TOP GURU OF THE EXPERIMENTAL BRAINWASHING ELECTRONIC SOUND FOR CENTURIES! your music lives on con. thanks Conrad for al your sounds and strange music,it was really inspired.i hope back there on the other side they love you allso,just do'nt work 'in progress' to hard! for them. rest in peace Con , your sadly missed.